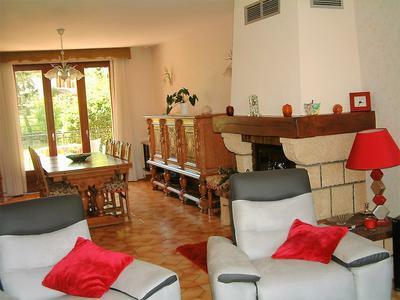 Attractive villa, built in 1982 of a brick construction on a semi-basement. 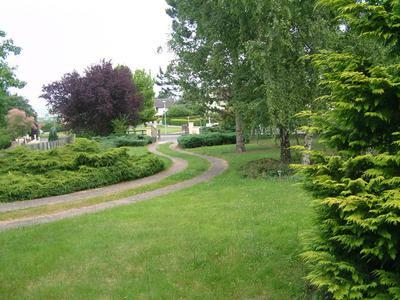 The accommodation is spacious in a large enclosed garden of 2300 m² with lawn, trees and an orchard. Also a good size patio, walled, paved and fitted with lighting and an electric point for alfresco meals in the garden. With electric gates. With a flight of steps to a raised ground floor and a spacious entrance hall and two hallways, one hallway with a cupboard, leading to a large living-dining room of 40 m² with an attractive fireplace and doorways to balconies at the front and the back of the property. 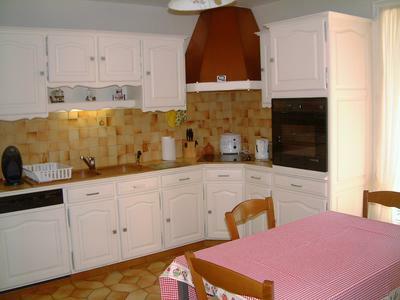 A fully equipped kitchen with door to the rear balcony and garden. Two bedrooms with fitted cupboards and one with a shower room. A library/bureau (or 5th bedroom), also a bathroom and a separate toilet. An internal staircase leads to two hallways in the semi-basement leading to bedrooms, three and four, and an office (or 6th bedroom). Plus a generous sized utility room and a shower room with WC. A door leads to the garage in which you can easily park four cars. The garage has a rear door and a folding door at the front. Another door in the garage leads to the cellar.